These are my favorite cookies ever. It's not even because I like chocolate chip cookies. I love these cookies because of how happy they make my loved ones. Because it's Thanksgiving Eve, I'm going to make this post a pretty quick one. I figure this recipe might be useful for tonight, when you need to rustle up a quick meal, or even the day after Thanksgiving, when you'll probably have random leftover vegetables. You know those really cute, really sweet, really crunchy cookies that are rolled up to look similar to elephants' ears? I don't like them. I don't understand their use. You never see them at parties and you never hear your girl friend say, "You know what sounds delicious? Elephant ears!" I can only imagine these cookies at a tea party, the guests obligingly biting into them after having scarfed down all the mini cucumber sandwiches and scones. And so, when my chef instructor at Le Cordon Bleu recommended we make these Palmiers puff pastries, I paid attention to her demonstration of preparing the cookies, but then blew it off mentally. Why don't I like these cookies, you ask? They're too sugary. They're too crunchy. You bite into one, and instantly, crumbs go flying about in every which way but into your cupped hand held up eagerly to catch the mess below your mouth. But alas, after class, I had more leftover puff pastry dough than I knew what to do with. (After all, I couldn't subject my arteries to making any more Brie en Croute.) So I decided to give these Palmiers a try. But I baked them at a lower temperature so they had a lightly crispy, totally flaky outer layer, but soft inside. 2. Roll out the dough into a rectangle, about 1/4" thickness. 3. Mark the middle lengthwise, just by putting a small indentation with your index finger. 4. Lightly coat the whole surface of the dough with water. 5. Mix cinnamon and sugar in a bowl and sprinkle over the whole surface of the dough, coating an even layer of sugary oodness. 7. Slice the dough in 1/2" pieces, then move to a parchment-lined baking sheet, laying them on their sides. 8. If you have some leftover cinnamon-sugar, you can sprinkle it lightly onto the cookies. 9. Bake cookies until light golden brown, about 20-25 minutes. But to be safe, check them at 15 minutes. My Notes: What if I want crunchier cookies? For a crunchier cookie, bake them at 425 degrees until golden brown. This will take less time, of course, and will likely be finished in 8-10 minutes. I've been yammering on and on about Brie en croute and Elephant Ears, offering recommendations for both store-bought puff pastry and homemade. Naturally, the store-bought variety hardly stacks up against the homemade real deal, but that doesn't mean you can't cut corners once in a while. If you're hosting a party with little time to prepare for it, by all means, buy the dough. It isn't expensive, anyway. But if you would like to make your own or perhaps even just have an understanding for how puff pastry dough is made, read on. 1. Sift the flour. Add to standing mixer with hook attachment, mixing on low. Slowly add the cubed unsalted butter. Add a pinch of kosher salt. Add the cold water. Let mix until most of the dough is clumped onto the hook. There should be visible chunks of butter in the dough. 2. Sprinkle your wooden board (or clean counter top) with flour. 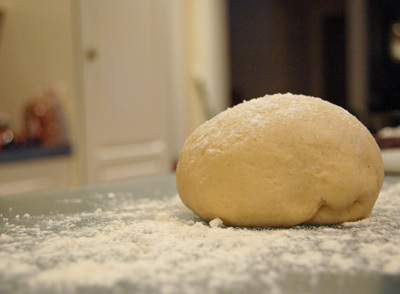 Gently roll out the dough into a rectangle, to about 1/4″ thickness. 3. Arrange the dough long-ways (like a placemat). Fold up the left and right sides to the center (like window shutters). Then fold it in half like a book. 4. Cover with plastic wrap and place in refrigerator to rest, about 1 hour or even overnight. 5. Roll it out into a rectangle again. Repeat Step 3. Cover with plastic wrap and place in refrigerator to rest, about 30 minutes to an hour. Repeat once more. 6. It’s done! After you have rolled and folded your dough 2-3 times, it’s done. Allow it to chill and rest another 30 minutes to an hour before starting the Brie en croute. Recently, at a friend's BBQ, someone made these incredible mini apple pies. They were comforting, homey, crunchy, sweet -- everything a good pie is. Even though I was full, I scarfed down a few of these suckers, unable to contain myself. Between mouthfuls of pie, I vowed I was going to make these at home. But then I recalled watching my friend make them. Dough, eggwash, pie filling, apples, spices and flour were spread all over the counter as she hurriedly filled and pressed together pieces of dough. It looked like... So. Much. Work. Don't get me wrong -- the pies came out perfect. They were little, golden, crusty pockets of heaven. But between working full-time and going to school every evening, I wouldn't be able to justify spending several hours on pie, particularly when much of the labor is in the assembly process. So I cut a few corners, partially working off the back of my Pillsbury pie crust box and this recipe from Smitten Kitchen. My recipe includes both an apple pie filling and a peach pie filling. Read on and you'll learn how to make these mini pie cookies in no time. 2. Prepare pie dough: Roll out the pie crust to about 1/4 inch thick. Get two differently sized cookie cutters (or drinking glasses) and cut out little circles. Cut out six 3" circles and six 3.75" circles. 3. Prepare eggwash: Beat the egg in a small bowl. Add 1 teaspoon water and mix. 4. Create apple filling: Mix sugar, cinnamon, nutmeg and salt in a bowl. Peel and chop apples into little squares (about 1/8" thick, 1/4" squares). If they start to turn brown, squirt with some lemon. Toss apples into the sugar-spice mixture. 4. Or create peach filling: Drain the peaches. In a bowl, combine with sugar and cinnamon. 5. Assemble the mini pies: Put some water in another small bowl. Roll up a paper towel and dip it in the water. Moisten a 3" circle of pie crust with the paper towel. Spoon a small amount of filling onto the circle. Cover with a 3.75" circle of pie crust and press the sides to close. Crimp the edges with a fork. 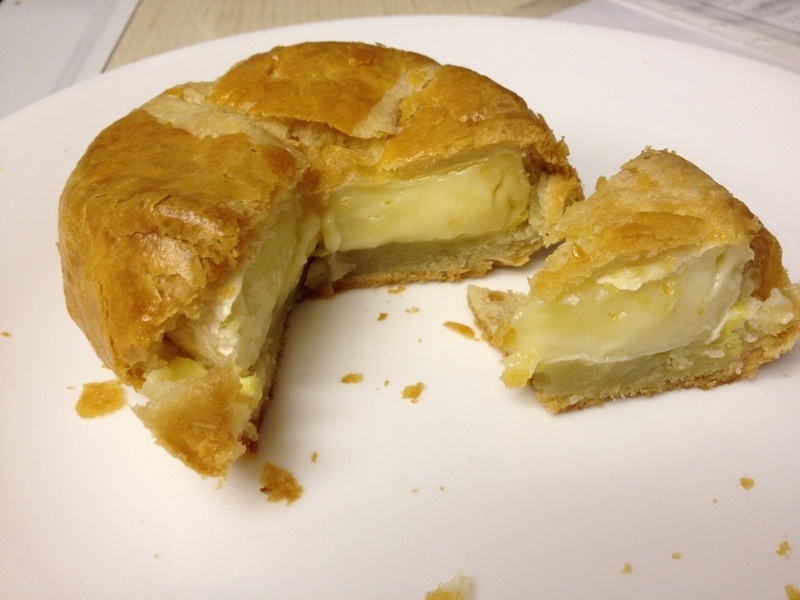 If desired, cut three little slits on the surface of the mini pie (refer to picture.) Repeat on all the dough. 6. Brush each mini pie with egg wash. Place pies on a baking sheet lined with parchment paper or silicon baking mat. Bake in oven until light golden brown, about 20-25 minutes. My Notes: Why Golden Delicious or Granny Smith apples? These apples are pretty sturdy, so their firm texture holds up during the baking process. Plus, they both have a crisply tart taste. Golden Delicious apples tend to be a bit sweeter, while Granny Smith ones tend to be more on the sour side. Simply choose the variety you prefer. Why canned peaches? Aside from requiring less preparation time and effort, canned peaches are much softer and sweeter than the fresh kind. As a result, you'll have a gooey, sweet filling for your mini pies. But the Pillsbury Pie Crust box says to use a baking time of about 425 degrees: Baking these tiny pies at a lower temperature ensures they get cooked through and reach a lovely golden brown before getting a chance to burn. Why use egg wash? This egg-water mixture provides a glossy finish to the pies, and helps keep them from burning. Can I use different filling? Of course! You can use whatever filling you'd normally use in a pie. What do I do with any extra filling? Um... eat it! Warning: for chocolate lovers only. This recipe was so easy, so delicious, I mastered it in one try. The result is a sweet, soft chocolate cupcake with a glossy, smooth chocolate ganache top. I'll have to credit Giada de Laurentiis with this one, though I'm proud to say my version has a few substitutes, ricotta cheese and a little extra sugar. Though this cake may take awhile -- about 3 hours total, including prep, cooking and cooling time, it's sure to be a party favorite. The recipe makes at least two dozen treats that your friends won't be able to turn down. 1. Line cupcake pan with paper liners (or arrange foil cupcake wrappers on a baking sheet) and preheat oven to 325 degrees. 2. Combine the unsweetened chocolate and water in a small saucepan over medium-low heat. Stir constantly until the chocolate is melted, about 2 minutes. Cool for 2 minutes. Whisk in the ricotta cheese until the mixture is smooth. 3. Beat the sugar, oil, eggs, and vanilla in your mixer. Stir in the chocolate-ricotta mixture. Then add the flour, baking soda, salt, baking powder, and chocolate chips. Stir until just blended. 4. Transfer the mixture to a large mixing bowl with spout and pour into the cupcake pan. Alternatively, you can use an ice cream scoop or large spoon to add the mixture to your pan. Allow batter to rest for about 10 minutes. 5. Bake cupcakes for 20-25 minutes or until a toothpick inserted into the center of the cupcake comes out with a very thin -- barely visible -- layer of chocolate. Cool the cupcakes completely before dipping in ganache, about 1 hour. For the ganache: 1. Combine the heavy cream, vanilla extract and sugar in a small saucepan over medium-low heat. Cook until small bubbles appear on the outside edge of the cream. Pour the hot cream mixture in a bowl, over the chocolate chips. Whisk gently until all the chocolate is melted and the mixture is smooth, about 2-5 minutes. 2. Dip the tops of each cupcake in the ganache and transfer to a baking sheet. Place the dipped cupcakes in the refrigerator to set, about 20 minutes. Allow cupcakes to return to room temperature before serving. My Notes: Mine vs. Giada's: The first time I made this I had trouble finding mascarpone at the store, so I substituted it for ricotta cheese instead. Ricotta is light and airy and creamier than it is cheesy -- three very important elements when baking a goodie. Also, when I was making the ganache and taste-testing it, I felt it wasn't quite sweet enough. I prefer it with a tablespoon of sugar. If you choose to add it too, make sure you add it in the saucepan while you're heating the cream and vanilla in order to make sure the grains are incorporated well. Why go semi-sweet and unsweetened? The reason it's a good idea to stick with the semi and un-sweetened chocolate is so you can control the level of sugar that goes into your cake. I love sweets just as much as the next person, but there's no greater buzzkill than when you realize you can't finish a cupcake because your teeth start hurting halfway through. Why let the cupcakes "rest?" I learned this one from Giada! Allowing the batter to sit in the baking pan before popping it in the oven results in puffier cupcakes. This recipe should result in a puffy top so it best holds the ganache -- plus, you want a wider surface for that sweet chocolate casing. When do I use foil cupcake wrappers? When you don't have a cupcake pan, of course. I only have one cupcake pan so sometimes it's easier for me to use the foil wrappers and arrange them on two baking sheets rather than waiting for my first batch of cupcakes to cool before baking the next one. In seeking out new, tasty recipes, you'll probably find that constantly whipping up rich and creamy foods gets old pretty fast. Sometimes you just want something a little lighter, and this spinach and ricotta-parmesan stuffed shells is just the meal. I'll admit, it requires a considerable amount of prep and cooking time, but it's got plenty of easy-to-use ingredients that make the time whiz by. I found this recipe on EatingWell.com, but added extra ingredients here and there to achieve the tomato-laden, cheesy goodness of a gourmet baked pasta. 1. Preheat oven to 375 degrees. In the meantime, boil water for your pasta, and be sure to add a few tablespoons of salt just before you drop the pasta shells in. Cook shells until al dente. Drain and rinse under cold water. Set aside. 2. Heat oil in a nonstick skillet over medium-high heat. Add chopped onions and cook until softened, about 3 minutes. Then add the spinach and toss to mix well, seasoning with a pinch of salt and pepper. If you're using fresh spinach, be sure to drain the excess moisture after you've washed and trimmed it. Then add it in batches, adding more as the cooked spinach wilts. Let cool and set aside. 3. Mix all the ricotta, breadcrumbs, 1/2 cup Parmesan and nutmeg in a bowl. Add your cooked onions and spinach and season with salt and pepper. Stir in egg white. 4. Stuff each the reserved shells with a generous 2 tablespoons of your cheesy-and-veggie filling. 5. Spread 1 1/2 cups marinara sauce at the bottom of a 9-by-13-inch baking dish. 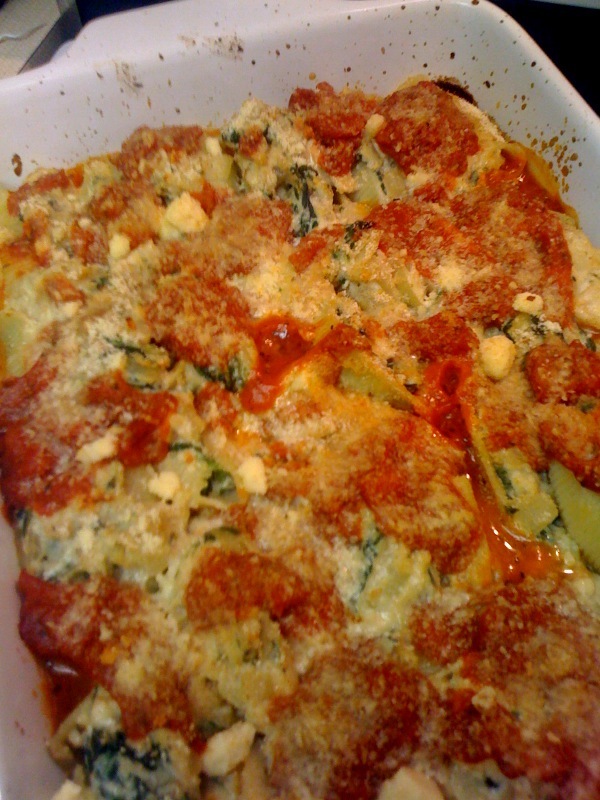 Arrange the stuffed shells in a single layer. Top with the remaining 2 1/2 cups of the sauce and sprinkle with the remaining 1/4 cup Parmesan cheese. Bake until the top has a nice, golden crust, about 30-35 minutes. Let cool for a few minutes before serving. My Notes: Mine vs. EatingWell's: EatingWell has a ton of really great recipes -- you can search by low-sodium, low-carb, heart-healthy, you name it, it's there -- but some of them are too dry for my liking. I prefer pasta with a rich, hearty marinara sauce, and with the sharp, salty bite of Parmesan cheese. I added extra of both, and made sure to season my onion and spinach with salt and pepper. I also used more breadcrumbs for more crunch. More marinara? If you really can't get enough marinara sauce, try adding a small jar of diced tomatoes to the mix. Make sure you counter the bitterness of the tomatoes with a teaspoon of sugar. A whole extra jar of prepared sauce is too much as it isn't likely to fit in your baking dish and would drown out the taste of the cheese. Homemade dinner? Who actually has time for that these days? No matter the situation -- whether you work full-time, go to school full-time or take care of kids full-time -- there's always an excuse to grab the takeout menu and order your usual chicken teriyaki with brown rice. But this salmon recipe, adapted from Simply Recipes, may well be the quickest, easiest fish you'll ever make. Just 10 minutes of prep time (5 minutes, once you've mastered it!) and pop this sucker in the oven for several more minutes. It's so simple that if you mess up the ingredient proportions, you still wind up with a delicious baked salmon. It's healthy, it's elegant and it's oh-so-tasty. 1. Preheat your oven at 400 degrees. Place the salmon on a lightly greased baking sheet, skin side down. Season with salt and pepper. 3. Spoon mixture onto the salmon, making sure it's spread (at least somewhat) evenly. Sprinkle with a little more salt and pepper then finish it off with the panko on top. 4. Bake for 12-14 minutes, until the panko bread crumbs are a light golden brown and/or the salmon flakes when poked with a fork. My Notes: Mine vs. Simply Recipes'. I first made this fish when all I had in my pantry was panko and a bunch of dried herbs. All I needed from the store was the honey mustard and salmon. I went ahead and bought honey mustard dressing (rather than the actual condiment) because I knew I could keep it in my fridge for a long time and use it to flavor homemade salads. I didn't bother buying paprika since I rarely cook with it; its absence also helps the thyme and parsley stand out on their own. As for the ingredient proportions, I felt the original recipe was a bit dry and bland. A few tablespoons more of honey mustard gives it the tangy, savory kick and the extra drizzle of olive oil helps the salmon stay moist. Not too long ago, I tried this recipe with honey mustard (rather than just the dressing) and I definitely wasn't pleased with the results. The salmon ended up being more bland, and I realized the dressing complements the herbs much better. What's panko? Panko is a Japanese bread crumb. The little, light yellow flakes have less sodium and carbohydrates than regular bread crumbs. You normally see it on tempura, and you can use it when making just about any food that requires breading. Best of all, panko is really easy to work with because it stays on food and it doesn't burn easily.